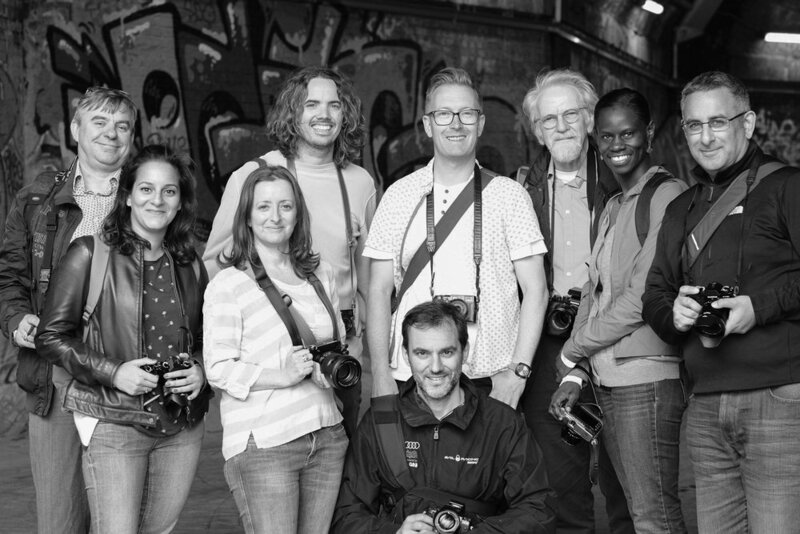 Andrew Newson with a group doing the Love Fujifilm X Camera workshop. Let me give you a little bit of background so you can make an informed decision on whether I might be the right person to help you with your camera. I first started running photography courses along side my photography business in 2008 and since then that side of things has grown fairly significantly to the point that photography courses, 121 training, events and holidays make up 99% of my business. I have small studio in Crowborough, East Sussex. This is right on the Kent and Sussex border and conveniently placed on the London Bridge to Uckfield line. I run courses and 121 training from here, but I also do a lot on location, specifically in the London Bridge area of London. I personally made a switch from using Nikon full frame cameras to Fujifilm in 2012. I started originally with the X-Pro 1. A camera that was actually quite flawed but somehow I grew to love. To be fair to Fujifilm, they made some significant firmware updates to that camera along the way and it became a much better camera. I still have that camera, I cannot bear to let it go! Since then I have used most of the Fujifilm X cameras line up and my first choice (at the moment!) is the X-Pro 2, although the X100T does get quite a lot of use too. When I first started offering photography tuition I thought a lot about my situation when I was starting out; just enjoying photography for a hobby and then how that progressed to become a career. I could have really fast-tracked my learning if I had just found the right courses for me. A lot of the time I learned online and from books. That’s all well and good but if you want a faster route then photography courses can be a really good option and save you a lot of time. Plus I think for some people (myself included) you have to be very disciplined to teach yourself. I started running courses in 2008 and I quickly thought about what would have been really useful to me when I was learning, but I also wanted them to be fun and as far away from a classroom style as possible. The first course I started was called Photoclub Creative and that stills runs today. A creative photography course over 6 months in a relaxed environment - the pub! People liked the relaxed approach and enjoyed the socialising aspect too. I’m really passionate about photography and I’m often told that comes out through my teaching which I believe is important. I'm enthusiastic and I want you to get your money's worth from me, so I will impart as much knowledge as I believe is appropriate for each individual. But I don't want to overload you with information either, too much and you simply won't be able to retain it. Whilst out on walks for these workshops I tend not to be constantly looking over your shoulder, but instead give you space to be creative. However I am always on hand for when you need me, whether it’s creative or technical help, you only need to ask and I am always happy to help. I like to encourage people with positive comments but also offer constructive advice when I think things could be done differently for better results. This can be of particular use during the image feedback session that we do for this Fujifilm X Camera workshop, which is always well received and a nice way to round off the day, not least because we do it in the pub! Your Fujifilm X camera looks and works slightly differently to most modern cameras. The term ‘Retro Design’ is used a lot but I prefer to think of it as classic design, design that works. Your Fujifilm X camera is either a ‘compact camera’ or a ‘compact system camera’. The term compact camera is usually used for a small camera without interchangeable lenses such as the X100/X70 range. A Compact System Camera (CSC) is used for a small camera that does have interchangeable lenses. These cameras are also called Mirrorless cameras, due to the fact that they have no mirror prism system like an SLR has. Because the Fujifilm X camera system does not use a mirror prism it means that the camera can be a little smaller and lighter than most SLRs. It also means that if your camera has a viewfinder, it will be different to an SLR, yours will be an Electronic Viewfinder (EVF) which means you see an electronic version of the scene. An SLR uses a mirror prism system to bounce your vision through the lens itself, meaning you see an optical version of the scene. Both systems have their pros and cons. One of the downsides of an electronic viewfinder is that it uses more battery power than SLRs. I strongly recommend you carry spares with you for your Fujifilm X Cameras. I use a third party brand from Amazon called Ex-Pro and they have been pretty good. The Fujifilm X-Pro and Fujifilm X100 range have hybrid viewfinders, meaning they can be either electronic or optical. However the optical viewfinder is only approximate to the field of view and cannot be trusted 100%. Don’t be fooled by the stylish classic design of your Fujifilm camera, because inside it’s all pretty high tech stuff and the lens quality is outstanding on these cameras. If you have already made the move in to Fujifilm then I sincerely hope that you will love using your camera, I have no doubt you will. If you haven't yet committed to buying a Fujifilm camera then please do feel free to drop me an email and I will happily give you some advice before you buy. View my Fujifilm X Camera workshops at Fujiholics here.